2012-13 Rs. 25 - 50 Crore Approx. 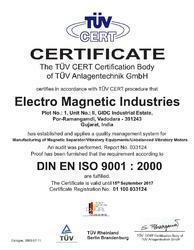 We, at Electro Magnetic Industries, an ISO 9001:2000 certified company, are amongst the leading manufacturers, importers and exporters of this highly commendable range of Magnetic & Vibratory Equipments, ever since our establishment in the year 1978. The range, comprising the finest Magnetic Separators, Vibratory Equipments and Vibratory Drives, has a high preference in the market. Making of this range is done in accordance with the set industry norms and guidelines, utilizing the finest raw materials and modern machines. Further, the offered range is marked at the most reasonable rate possible. The highly advanced state-of-the-art infrastructural facility laced with all the necessary machinery and equipment, which facilitates the attainment of several of the firm’s predefined goals and targets. The facility parted into a number of highly operational units, help us in managing the firm’s operations, in the best possible manner. Further, the facility is up-graded on a highly regular basis, which facilitates extending of our reach in the market. Our huge client base across the Globe ( New Jersey, France, South Africa, Ghana, Iran, Iraq, Sri Lanka, Singapore, Australia, Canada, Chile, Brazil, Nigeria, Dubai, Pakistan, Russia, Indonesia ) is owed to our highly ethical work practices. Under the guidance of our Manager, Mr. Pallav Patel, we have managed to attain several of the firm’s predefined goals and targets. Further, his ability to understand the market and make commendable decisions has helped us in generating a smoother path to success. The highly advanced state-of-the-art infrastructural facility at Electro Magnetic Industries, has been laced with all the necessary machinery and equipment, which helps us in the attainment of a number of the firm’s predefined goals and targets. For reasons of attaining smoother and effective management of the firm’s operations, the facility has been parted into several highly operational units. In addition to this, the facility is regularly upgraded, for reasons of attaining a better position in the market. The team of highly skilled and experienced professionals, help us n the attainment of several of the firm’s predefined goals and targets. These professionals are recruited on the basis of their skills and ability to perform. To manage their operations, in the most efficient and effective manner, the team has been sorted into a number of highly operational units. In addition to this, the professionals are trained on a highly regular basis, for reasons of keeping them at par with the ever changing market. To us at Electro Magnetic Industries, providing quality is something of high importance. Thus we engage in the utilization of high grade raw materials and modern machines, as per the norms and guidelines of the industry. This ensures the product’s performance and longer service life. in addition to this, the offered range is known to be processed through several rounds of quality examinations, where all manufacturing defects are eliminated with high level of precision. We are amongst the leading manufacturers, suppliers and exporters of this highly commendable range of Industrial Machinery. To live up to this market standing, we engage in the utilization of high grade raw materials and modern machines, in compliance with the set industry norms and guidelines. This ensures the product’s performance, capacity, strength and service life. In addition to this, the range is made available in the market at the most reasonable rate possible and is delivered in the timeliest manner.